The North East Aircraft Museum's exhibit XL319 was flown into Sunderland Airport (now the Nissan Car Factory) from Waddington on 21. January 1983. It served with squadrons 617 (The Dambusters), 44 and 83 (these squadrons were based at either Waddington or Scampton). It was, in fact, the second B2 delivered to 617 squadron on 20 October 1961, and is featured prominently in a photograph showing a line-up of 617 squadron aircraft on Page 90 of 'Avro Vulcan' by Robert Jackson ( published by Patrick Stephens ). It is one of twenty existing, still-complete Vulcans. The Vulcan started life as the Avro 698. Originally Roy Chadwick, the designer of the Lancaster, was heavily involved in the project before his untimely death in 1947. The Vulcan was a 'new-technology' aircraft (along with the Victor). It was essentially a bomber which was designed to evade interception by fighter aircraft by flying fast and high. Part and parcel of this was that the aircraft had no defensive armament, which thereby reduced weight and allowed an aerodynamic profile and helped to increase speed and height. This was a new idea for the British aircraft industry which, during the war, had been producing the Lancaster and Halifax which were designed to carry very heavy bomb loads at the expense of altitude and speed (the Mosquito being an exception to this rule). An older technology aircraft, the Valiant, was also built as a stopgap, and in case the other two designs failed to come up to scratch. However both the Vulcan and Victor were successes and for a time these three aircraft constituted the V-Bomber force of the RAF, although the Valiant was withdrawn in 1965. Initially there was intense competition with the Victor of Handley Page and indeed there was doubt as to whether both the Vulcan and Victor would pass into RAF service, even when , in June 1952, simultaneous orders were placed for 25 production models of both the Vulcan and Victor. Both the original Vulcan B1 and B2 entered RAF service with 83 squadron. The B2 had an increased wing area, an aerodynamically-improved wing and more powerful Olympus engines. In addition, it possessed increased ECM (Electronic Counter-Measures) equipment contained in a bulge behind the tail. Most of them were capable of carrying a Blue Steel stand-off nuclear missile and the first squadron actually to be equipped with Blue Steel was 617. On May 1 1960, Gary Powers was shot down in his U2 spyplane, above 20.000 meters, by a missile - height was becoming less of an advantage. The Vulcans switched to a low-level role and in 1964 an appropriate upper camoflauge of green-grey was adopted (previous Vulcans had been all white to deflect nuclear flash). V-bomber numbers also peaked in 1964 when there were 159 - 70 Vulcans, 50 Valiants and 39 Victors. It had been planned to fit Skybolt air-launched ballistic missiles but this program was cancelled by the Americans and in 1962 it was planned to replace Skybolt with Polaris. The nuclear role was eventually taken over on 30/6/69 by the Navy's Polaris submarines. 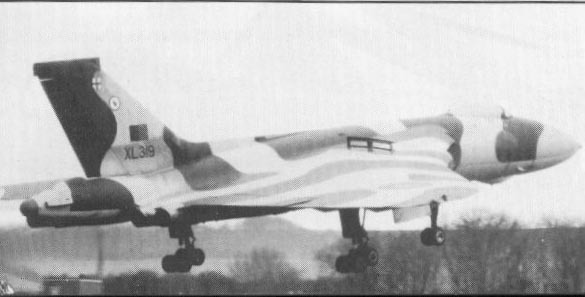 A planned uprated version of the Vulcan, with 6 crew, never materialized. 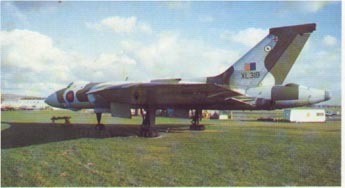 They were eventually replaced by the Tornado in the early eighties, not before some Vulcans had seen military action, for the first time in the aircraft's history, in the Falklands. 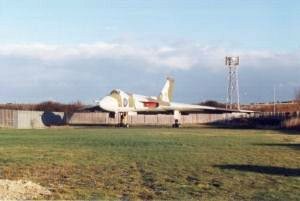 The decision had been made to start the disbanding of the 8 Vulcan squadrons starting from 11/12/81, to be completed by the end of June 1982. But on 2/4/82 Argentina invaded the Falklands (Malvinas). April 30. - 16 hour flight by XM607 serviced by 10 Victor tankers (some Victors were required to refuel other Victors). More fuel was used than expected because the Vulcan had to fly lower than maximum i.e. at the height of the Victor tankers. The Vulcan only had enough fuel to get in and out in a straight line. It dropped 21 bombs at an angle to Port Stanley runway, one of which hit the target (as was the intention). May 3. - XM607 again struck against Port Stanley runway, but this time missed. May 29. - XM597 carried 2 Shrike anti-radar missiles but both missed their target. June 1. - XM597 carried 4 Shrikes one of which disabled a radar station and killed three of its operating crew. On its return leg, its fefuelling probe broke and it was diverted to Rio de Janeiro (where it was interned for the rest of the war). June 12. - General bombing raid by XM607 by which time British troops had landed. Six Vulcans were converted to tankers (as a stopgap until the VC10 tankers were to enter service) and these were operated by 50 squadron, alongside 4 bombers, until 31. March 1984. By end of 1984, all Vulcans had been retired except a couple retained for flying purposes. Of these, XL426 was withdrawn in 1986 and XH558 was withdrawn in 1993. Both are now in private possession and hopes of them flying again still exist. No Vulcans were exported although in 1981 Argentina had enquired about the possibility of acquiring ex-RAF aircraft to replace its Canberras. It was a contemporary of the American B-52. The design of the cockpit of the Vulcan reflects the need to shield the crew from the effects of a nuclear flash, there being very little window space. Crew would sit in darkness shielded from the pilots by the fallout curtain, and with the small portholes usually blocked. Ejection Seats were only provided for the pilot and co-pilot and there were several incidents where the pilots ejected leaving the crew to their doom. The crew had to exit from underneath the aircraft and even at a high enough altitude, g-forces made movement difficult. Martin-Baker produced a workable ejection system for the crew, which was demonstrated in 1960 - the crew were ejected, one after the other, thru the same opening in the roof. Martin-Baker even offered to fit three bombers at their own expense but, in the end,all that appeared were inflatable bags inserted into the crews' seats which pushed them towards the floor exit in an emergency. The delta wing apparently developed "by accident". The original design had more conventional swept-back wings but was much too heavy - there was no option other than to reduce weight by reducing the wing span. However, in order to maintain lift, the wing area needed to be constant and so every reduction in wingspan was compensated for by filling in an area between the trailing edge and the fuselage until, eventually, a delta wing emerged. Roy Chadwick took no part in this phase of wing development because he was off ill but he was apparently highly satisfied with the shape because he already been highly interested in work on delta wings carried out in Deutschland before the war, by Alexander Lippisch (Lippisch appeared after the war in work for the Americans). The wing was originally was a pure delta, but this produced certain problems at high speed which were overcome by reducing the sweep-back at mid-span from 52 degrees to 42 degrees and then restoring the 52 degrees at the tips. This new wing was introduced in 1956, replacing the original pure-delta wing on the first prototype XA889. Engines These were enclosed in the wings instead of in pods because that was thought to offer the best aerodynamic profile, although it is now known that the difference is very slight. The Olympus engines are an earlier series of the Olympus (593) engines used on Concorde. 20 tonnes of air per minute passed thru the engines. Windows Apart from shielding from nuclear flash, the prospect of structural weaknesses in windows in a presurized environment lead to a largely windowless environment, the windshield for the pilots offering a very restricted view. These Triplex windshields were bulletproof and electrical heating to keep them clear was managed with the help of gold films 0.0000005 cms. thick interleaved with the glass. On January 8 1971 XM610 from 44 squadron Waddington captained by Flight Lieutenant G.R. Alcock encountered trouble while taking part in a low-level sortie in Northumberland. Whilst climbing away from a low-level maneuver, two engines caught fire and, although they were both extinguished, the left wing continued to burn. The crew baled out while the pilots attempted to reach RAF Leeming. However, as the aircraft became more uncontrollable, they decided to clear the Tyne area and direct it out to sea. But now the rear fuselage was well alight and when fuel tanks started exploding, the pilots ejected. The aircraft crashed in a field near Wingate, County Durham. Flt. Lt. Alcock received the Air Force Cross. This was built as a research aircraft for the Vulcan program and an example is on view at Cosford Aerospace Museum. Engines 4 Bristol Siddeley Olympus 200 series or 301 (XL319 was built with Olympus 201s which were soon converted to 202s). Copyright (c) 2012 Sitename.com. All rights reserved. Design by CSS Templates.